Shea Terra Organics is one of my all-time favorite skincare companies. The company’s founder, Tammie Umbel, has dedicated herself to personally seeking out rare ingredients that are indigenous to remote parts of Africa, and then using those ingredients to create effective, organic skincare products for the masses. In turn, many of the products benefit women-run cooperatives by sustaining businesses that might otherwise be taken over by outside interests. I really love the ethical side of the business, but my love for Shea Terra actually has much more to do with the fact that they make highly effective skincare products. My gateway product was the Authentic Black Soap, which I bought and fell in love with back in 2011. Since then, I’ve probably worked my way through about 70% of the Shea Terra product catalog. Some of my favorites include the Argan Oil, Baobob Oil, Kalahari Ootanga Oil, Rose Hips Seed Oil, Cape Aloe Topical Healing Gel, Rose Hips Black Soap Facial Wash, Tamanu Licorice Facial Wash, just about every face mask they produce, and now, the new Argan, Zafron & Camel’s Milk Brightening Lait Cre’me. The Argan, Zafron & Camel’s Milk Brightening Lait Cre’me ($32) is a facial moisturizer that promises to moisturize as well as even out skin tone. It contains ingredients sourced from Morocco. Pure aloe vera leaf juice, organic argan oil, vegetable emulsifying wax, camel’s milk, natural based preservative (gluconodeltalactone), sodium benzoate, naturally grown Moroccan saffron threads. As you can imagine, I was super excited about the lack of fillers in this ingredient lineup – not even water is listed as an ingredient. 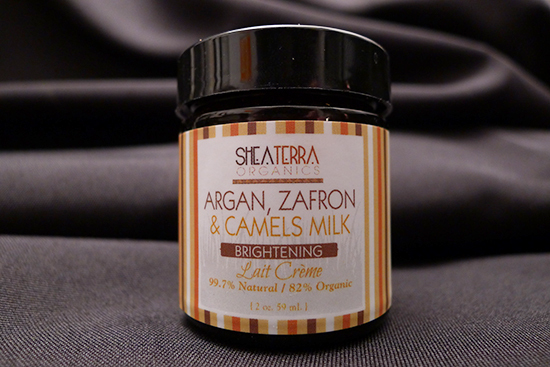 In general, I find that Shea Terra Organics doesn’t use fillers in their skincare formulas, and the Argan, Zafron & Camel’s Milk Brightening Lait Cre’me is no exception. In addition to the absence of fillers, the ingredients this moisturizer does contain are pretty exciting. Aloe Vera Leaf Juice – Aloe is a classic skincare ingredient for very good reason. It contains antioxidant properties with Vitamins A, C, and E, fatty acids, anti-inflammatory and antibacterial properties, as well as naturally occurring salicylic acid. It’s fantastic at treating acne, redness, and dryness, among other things. If you’d like to learn more about this wonder plant, check out this summary from the Indian Journal of Dermatology. Camel’s Milk – Camel’s milk contains the AHA lactic acid, which has skin softening and exfoliating benefits. It also possesses some anti-bacterial properties, and contains Vitamins C, A, B1, B2, and B12. Saffron – Saffron is a rare (and expensive!) spice that possesses outstanding antibacterial, antifungal, antiviral, and anti-inflammatory benefits. It also contains a polyphenol called “curcumin,” which is an antioxidant. It’s sometimes used in anti-acne treatments because of its anti-inflammatory and anti-bacterial effects. There are no red flags in terms of irritants or potential acne triggers in this formula according to COSDNA, although, it’s worth mentioning that COSDNA did not have any data on the camel’s milk or the saffron ingredients. This product definitely has a smell. It’s not overwhelming, but the first time I caught the scent, my actual thought in that very moment was, “Whoa, that’s a little funky.” I would describe the smell as slightly sour, in the same manner that a plain yogurt smells sour. The smell isn’t identical to yogurt, but they’re certainly cousins. Surprisingly, I’ve grown really fond of it. I no longer find it “a little funky.” I now think it just smells like beauty. I apply a chickpea sized amount as the last step in my skincare routine at night, just after applying my face oil. In the morning, it goes on just after my sunscreen if I’m wearing a chemical sunscreen, and just before my sunscreen if I’m wearing mineral-based sun protection. I find that the chickpea size amount easily covers not only my face, but also my neck and décolleté area. It spreads very easily – in spite of its thick texture in the jar, it has a very satisfying amount of slip when gliding it over my face. There were a few days when my skin was sensitive as a result of over-exfoliating – I found that on those days, the Argan, Zafron & Camel’s Milk Brightening Lait Cre’me caused a bit of a tingling sensation when applied. It was not unbearable, and it subsided very quickly, but it’s worth noting. This moisturizer sets rather quickly, and dries matte. 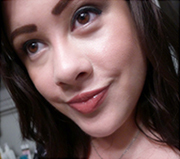 I love the way foundation glides over this product – it works exceptionally well under makeup. My current skin type has changed a little in recent months. A few months ago I would have characterized it as very dry, but it has normalized quite a bit since I switched from the cream version of prescription Tretinoin to the micro-gel version. These days I would describe my skin type as normal to dry. I began using Shea Terra Organics Argan, Zafron & Camel’s Milk Brightening Lait Cre’me in the beginning of November, and used it every morning and evening for the first 6 weeks. I’m on my second jar now, though for past couple of weeks I have been alternating it with my Benton Snail Bee High Content Steam Cream and another Shea Terra moisturizer (the Argan & Desert Date Ultra Moisturizing Face Cream). In terms of immediate results, the Argan, Zafron & Camel’s Milk Brightening Lait Cre’me moisturized my skin without leaving me greasy, and that moisture lasted through the day. After the first two weeks, my skin looked noticeably brighter. After four weeks, I noticed that some of my PIH (post-inflammatory hyperpigmentation) marks were lighter. The lightening of my PIH was definitely visible, but not as dramatic as I’ve seen with products such as the O.S.T. Original Pure Vitamin C20 Serum. This isn’t a complaint – I wouldn’t want a moisturizer that has the same intensity as the AHA in a serum like that – I’d be peeling and dry all the time! But for those who are specifically interested purchasing the Argan, Zafron & Camel’s Milk Brightening Lait Cre’me as a lightener for hyperpigmentation, I thought it would be helpful to make the comparison. I did not have any breakouts as a result of using this moisturizer, and in fact, it really helped reduce the inflammation and redness in the active acne I did have. 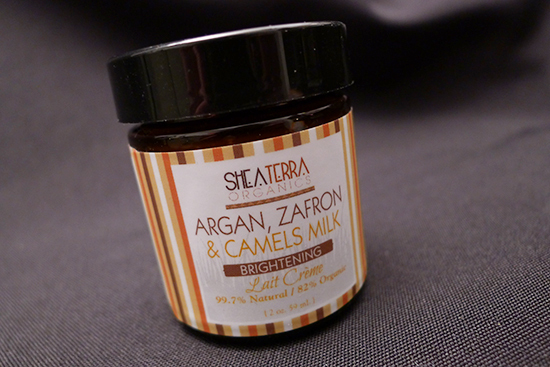 Overall, I absolutely love this Argan, Zafron & Camel’s Milk Brightening Lait Cre’me! It’s become a favorite, and has earned a place right alongside my beloved Benton Snail Bee Steam Cream on my skincare shelf. Between the two, I think the Benton Steam Cream is gentler for very sensitive or broken skin. Comparing the brightening/PIH lightening effects, I think the Benton Steam Cream produces more dramatic immediate brightening results, but the Argan, Zafron & Camel’s Milk Brightening Lait Cre’me is more effective at lightening my PIH over the long term. Performance: 5/5 – Moisturizes, brightens, lightens PIH, great texture. Quality: 5/5 – Stellar ingredient list with no fillers and lots of great actives. Value: 5/5 – This is one of the best moisturizers I’ve tried at any price, so $32 is a bargain. However, I only pay around $22 because Shea Terra sends out a 30% off coupon every month. I bought my Argan, Zafron & Camel’s Milk Brightening Lait Cre’me from the Shea Terra Organics website, where it retails for $32. However, Shea Terra sends out a monthly coupon for 30% off your entire purchase to its email subscribers. With the coupon, this moisturizer is $22. This month’s coupon code is JAN2014. This cream looks quite decadent! I am nearly done my Steam Cream…this may be next on the to-buy list! Do it! I think you’d like it. I’d love to know what you think of it if you decide to try it! Thanks, Tiffany! I include those links in my posts specifically for skin care nerds like yourself. 😀 If you decide to pick up the moisturizer, the Camel’s Milk mask is a worthwhile purchase as well. Really, all the masks are great, but the Camel’s Milk one is a nice companion for the moisturizer. Kerry!! I recently bought this but have not had the chance to use it. Wanted to use up some of my products before I open it but boy am I excited. I grabbed the Rose Hip Black Soap as well as the Tamanu oil shipped to Australia for $22. Think you’d be making a post on the break down of sunscreen/your favourite sunscreen any time soon? Interesting to know that you have a chemical and a mineral based sunscreen. Would totally look forward to it! I think my skin has a crush on you. Can’t get enough! Anne, I am so excited for you to try those things! I can’t wait to hear what you think of them. I’m not sure if you’ve had the chance to try the Rose Hips Black Soap yet, but it really is spectacular. I know of a lot of people that swear by daily use, but I thought you’d like to know that I personally find it to be too potent to use every day on my dry, sensitive skin. It’s definitely a 1-2 times a week treatment for me. I love it though. It does an excellent job exfoliating and my skin just glows after using it. I am curious about what your results will be with the Tamanu Oil. I bought a bottle a while back, but couldn’t get past the smell. It smelled strong but tolerable in the bottle, however, once I put it on my face, it smelled like a curry dish that was past its prime! I hear great things about it, though. It’s supposed to be good for acne, I’d love to know if you find that to be true. As for sunscreen, I do have a few I’ll be reviewing soon. The ones I’m using regularly right now are the Biore UV Watery Essence SPF50/PA+++ (chemical) and the Elta MD UV clear SPF 46 (mineral). I alternate between the two, but I tend to go for the Biore more often. I wish it contained less alcohol though – I’m still looking for my dream sunscreen! Cannot wait to read those reviews! I have not touched my She Terra stuff since I’m trying to finish my other stuff. I’d say I have a month left. At what times do you vary between the chemical and the mineral one? I’m currently using Skin79’s Perfect UV Protection. On my second tube but something doesn’t feel right with it. It is better than a lot of sunscreen I’ve used from drugstores though. You are a patient woman, Anne. Most of the time, I am so excited to try the next thing, as soon as I hit the 28 day mark I’ll move on. That is, unless it’s something I’m loving of course – then I put off trying anything new for as long as possible. Case and point: I bought a second jar of this Camel’s Milk moisturizer knowing that I have two new ones in the queue to try. As for the chemical and mineral sunscreens – I mostly reach for the chemical one, but I use the mineral one if I have any broken skin or a particularly heinous break out. I feel like there’s less risk of irritation with the mineral sunscreen. I also use the mineral one on mornings when I space out and forget to apply sunscreen before my moisturizer. That happens at least once a week. Mornings are not my friend! You always have the most interesting product reviews. Like, from companies I’ve never heard of. Lol. It’s awesome. This stuff looks lovely. Though the packaging (okay, and misreading the word ‘camel’ on it) make me expect it to have a caramel scent instead of sour yogurt. That’d be disappointing. Haha. Oh yeah, I can totally see the caramel possibilities now that you mention it. 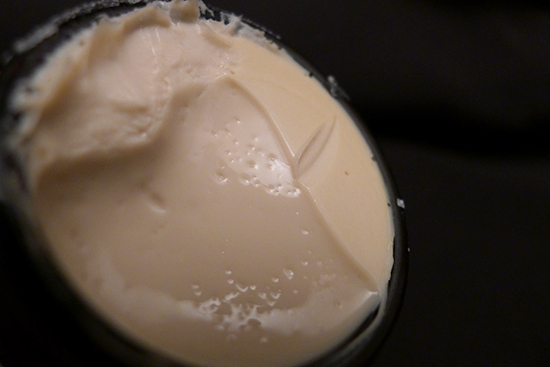 Even the color of the actual moisturizer is a little caramel-like, or perhaps butterscotchy! Would this be okay for day-time use? Is it shiny? I have very dry skin and gels aren’t enough for me. Thank you for posting about the study of gluconolactate versus BP. I’ve been using BP for about a year and a half to finally get rid of cystic hormonal acne on my cheeks and jawline (I still have some scarring and pits I’m trying to mitigate). Is gluconolactate a good substitute for BP, or is there a reason to use one over the other? Does gluconolactate still work well for preventing acne do you find, as well as clearing it up? I know BP can be drying, and I have had more fine lines form over the past couple of years, but I’m almost 29 so that may be due to aging (UGH, go away fine lines and crow’s feet!!!!). I put my skincare for reference below; I kind of guessed at where I should put the BP. Any feedback appreciated. Thank you for your blog. I love reading it! AM: 1) Mutenka foaming cleanser, 2) Mizon Tea tree toner, 3) Dr. Jart V7 eye serum, 4) Lioele Seaweed gel (if time), 5) primer sometimes (TonyMoly Milk Tea Morning pack or Lioele Sun Chiffon), 6) Skin 79 BB Cream (the green one). PM: 1) Mizon Real Oatmeal Cleansing Sherbert (LOOOOOVE THIS), 2) Mutenka foaming cleanser, 3) Mizon Tea tree toner, 4) Dr. Jart V7 eye serum, 5) Acne.org 2.5% BP, 6) Mizon Twilight Essence mist, 7) Mizon Black Snail Cream.